Podcast Awards Ceremony is Saturday Dec 6th! 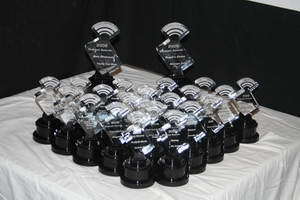 The 2008 People’s Choice Podcast Awards Ceremony is this coming Saturday December 6th at 1pm PST. We will award these trophies and prizes and announce the People’s Choice and Best Produced Winners. It will be a great event.